Your obsession for bagging all the peaks within a 50-mile range of your home is equaled only by your desire to find the right day pack. Well, look no more. 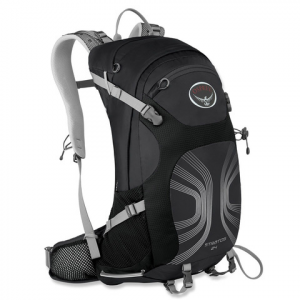 The Osprey Stratos 24 Backpack is the perfect solution for peak bagging and day hiking year-round. It's made of gutsy high denier nylon, with a sturdy lightweight frame that allows for plenty of support and ventilation and enough interior space to fit all the extra clothing and food you need for a long day on the trail or a night of camping. The Osprey Stratos 24 is a front loader with side mesh pockets, zippered hip belt pockets, and a small harness pocket big enough for an mp3 player or cell phone. There's an internal sleeve that's specially designed for a hydration unit and you can run the tubing conveniently all the way up to your mouth using the harness straps as guides. Other features on the Stratos 24 Backpack include an ice axe attachment and an integrated raincover.